Laptops, Blackberries, PDA's, removable storage drives, and smart phones enable us to get information on the go. We no longer have to be tethered to our desks to check our e-mail, surf the web, or access files and information. Advances in wireless communication have made communication mobile, but also made it easier for the unscrupulous to access our personal information. Unless you secure your mobile data against loss, theft and unauthorized access, you are vulnerable. How can you protect your mobile data? 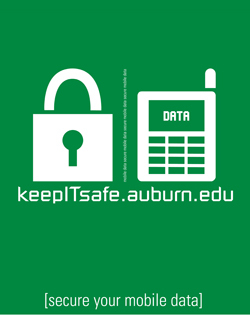 Encrypt off-campus Wi-Fi transmissions using the Auburn VPN (Virtual Private Network) when possible. Secure your USB Drive – don’t leave them behind in public labs. Use a third-party encryption method such as the open source truecrypt (http://www.truecrypt.org/) to encrypt your removable storage. Wikipedia is a good starting point for learning more about securing your USB drive. BitLocker To Go - a new feature of Windows 7 - gives the lockdown treatment to easily-misplaced portable storage devices like USB flash drives and external hard drives. This allows you to protect information stored on removable media with the same level of protection as the operating system volume. Secure your handheld device - your cell phone, iPhone, iPod Touch, Blackberry, or any other Smartphone data can be protected by simply setting a password on the device. Step #1 Immediately contact OIT by calling the HelpDesk at (334) 844-4944 or sending an e-mail directly to notifylink@auburn.edu. We can wipe out the data on your phone remotely. It can be restored later, but whoever finds your missing phone won’t be able to read all of your e-mail and other sensitive data in the meantime. Step #2 – Once OIT has verified the hard reset of your phone's data, call your service provider and disable the phone number so unauthorized calls cannot be made. Don’t reverse these steps. Once the phone is disabled, OIT won’t be able to access it to perform step #1. If you are not on the AU Enterprise mobile servers (this would apply to all students) and you lose your phone, contact your wireless provider to disable the phone. If you were using your phone to check any e-mail account via IMAP, change your password for that account. This will not remove the existing e-mail from the phone, but it will prevent future nefarious usage of the account(s). Only use legitimate hotspots (wireless access points) - make sure you know who owns the connection you are trying to access. Use a VPN client - Download a free VPN client at AU Install. When you connect to a wireless zone log in to the VPN to make your connection secure. For instructions see, How to use the VPN Client at AU. Enable your personal firewall - Microsoft Windows XP/Vista users have a personal firewall installed. Click your operating system for instructions on how to enable it: Windows XP | Windows Vista. Don't forget to secure your wireless network at home by enabling a password for the wireless router.